The Civil War is often characterized as having pitted brother against brother, while threatening to split the United States of America into two entities. Reconciliation of that strong divide is a major reason cited for commemorating the 150th Anniversary of the war. Most now agree that a century and a half after the start of the Civil War is more than enough time to put differences and hard feelings behind us. But long before this was the prevailing thinking, a woman who had been part of the inner circle of the Confederate movement supported reconciliation. Changes At the start of the war the Cary family left Vaucluse, their estate in Alexandria, which was eventually destroyed, and moved to Richmond. Although this move unsettled young Constance, she soon met her future husband Burton Harrison, secretary to Jefferson Davis, and was drawn further into the ranks of the Confederate inner circle. In fact, Constance and two cousins made the first three Confederate flags that were carried into battle. She also saw the results of battle. Her mother founded a hospital where Constance tended wounded soldiers and wrote their letters home. Refugitta Despite these duties, Constance still found time to write for Richmond newspapers under the pen name Refugitta and became a well-regarded author of articles and short stories. Although some describe certain language in her works as racist, the exploratory prose of the times emphasized the need to present all points of view to fully discuss an issue. In her Master’s Degree thesis, Gaillynn Bowman discusses how Constance used prose during and after the war to explore the wrongs inherent in slavery and the need to leave it behind, but wrote in ways that would be palatable to her audience, often presenting these thoughts in the form of an admirable fictional character. In her story Leander, Constance depicted a former slave who attained his freedom without help from whites and thrived in his new life in France. (Bowman, 78) The notion that former slaves could be successful and independent was a radical notion in the post-war years in both North and South and, according to Bowman, may have stemmed from Constance’s interactions with people of African descent in her travels throughout America and Europe after the Civil War. Loss & Recovery Constance Cary Harrison lost a great deal during the Civil War. Her home was leveled, her way of life destroyed, and she was briefly a prisoner of war for running a blockade. Yet, she focused on the end of slavery, the one important good she felt had come from the war, and strove to forward that cause through her writing. The Harrisons lived in New York City and Bar Harbor, Maine during their married life. Burton was a member of the Bar in New York and became a successful businessman and Democratic Party activist. She and Burton remained strong proponents of reconciliation between the North and South. Burton and Constance had two sons, Fairfax Harrison (1869-1938) -- who became President of the Southern Railway Company -- and Francis Burton Harrison (1873-1957) – who served as a Congressman and later as Governor-General of the Philippines under President Wilson. 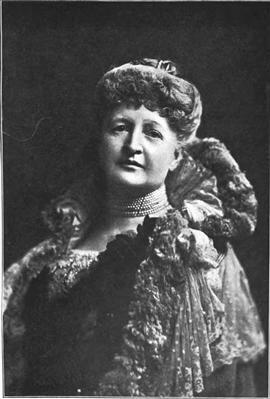 After her husband’s death in 1904, Constance returned to live in Washington where she wrote her memoirs, Recollections Grave and Gay. Copies of many of Constance Cary Harrison’s works are available to read or download at no charge from Google Books and ForgottenBooks.org. See links below. Refugitta of Richmond, Recollections Gay & Grave, edited by Nathaniel Cheairs Hughes, Jr. and S. Kittrell Rushing, was published in February. Please share your memories of Constance.